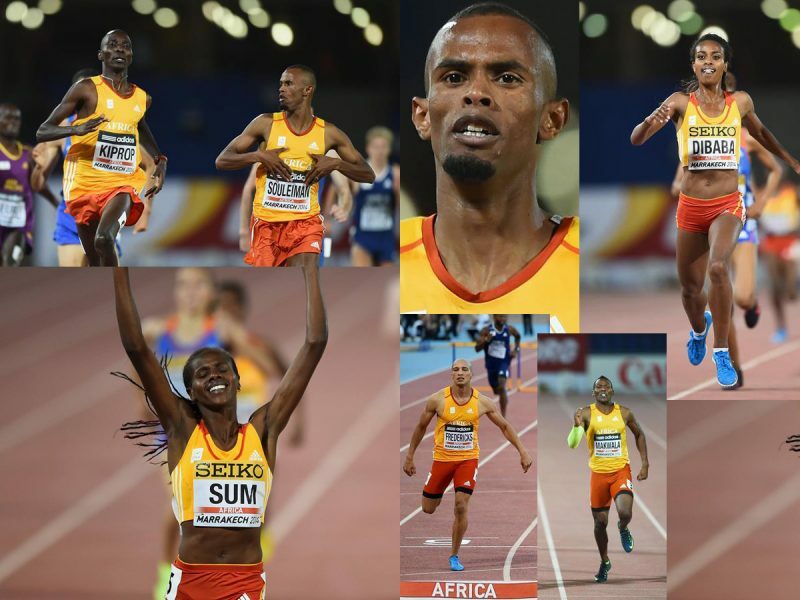 Kenyan Eunice Sum, South African Cornel Fredericks, Ethiopian Genzebe Dibaba and Ayanleh Souleiman of Djibouti gave Africa her first victories on Day 1 of the 2014 IAAF Continental Cup in Marrakech. 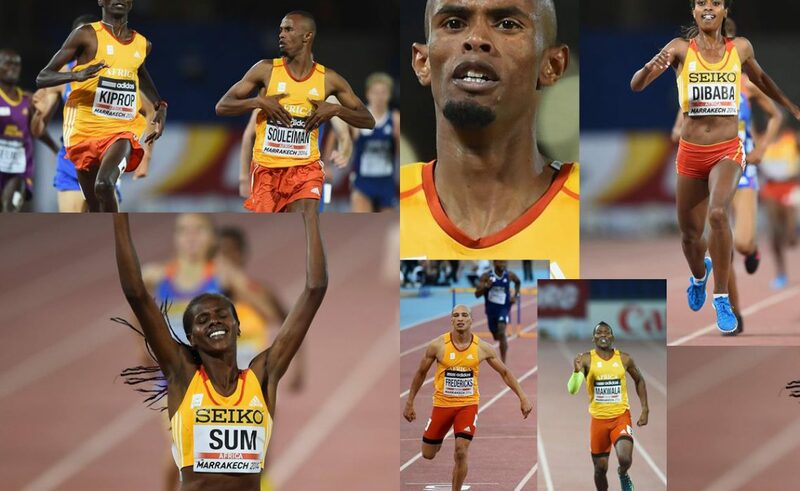 African champion Ayanleh Souleiman clocked 3:48.91 to win the men's 1500m at the IAAF Continental Cup on Saturday. The 21-year-old Djiboutian athlete overcame his arch-rival, world champion Asbel Kiprop from Kenya, at the Grand Stade de Marrakech just as he did to win the African Championships 1500m last month. Kiprop finished second in 3:49.10 with Team Europe's Mahiedine Mekhissi-Benabbad of France claiming third place in 3:49.53. Genzebe Dibaba won the women's 3000m in 8:57.53 ahead of Europeans Meraf Bahta (8:58.48) and Susan Kuijken (9:01.41) with Team Africa's Janet Kisa from Kenya in fourth (9:01.72). World 800m champion Eunice Sum, from Kenya, claimed maximum points for Africa in 1:58.21. Team America's Ajee Wilson was second in 2:00.07 with Team Europe's Marina Arzamasova taking third place (2:00.31) ahead of Team Africa’s Tigist Assefa (2:00.57). African champion Cornel Fredericks, from South Africa, won the men's 400m Hurdles in 48.34 ahead of Team Europe's Kariem Hussein of Switzerland (48.47) and Team America's Javier Culson (48.88). Team Europe's Rasmus Magi, from Estonia, finished fourth in 49.23 while Nigeria's Cristian Amaechi Morton clocked 49.65 for fifth position. African champion Isaac Makwala came second in the men's 400m (44.84) behind Team Americas LaShawn Merritt (44.60) - a two-time world champion. Asia-Pacific’s Yousef Ahmed Masrahi, from Saudi Arabia, finished third in 45.03. It was my last race of the season and, certainly, I expected to win here defending all Africa's colours. But it was too slow a race for me. I don't feel comfortable using such tactics. That is why I couldn't wait for last lap to make my final acceleration and I started to push 800 metres before the finish. I'm going to take a rest now as it was very varied season for me. It is a season full of winning, and this time it's not only for my country but for the whole continent. I didn't panic when running with Ajee Wilson and I made a big achievement today. Marrakech's weather was a benefit for me because normally I run well in hot conditions. I am going to take a break (from competition) until next year. It was great race for me. I expected to be first at the finish here as I checked the track before at African Championships and it looked fast and very comfortable for me. I respected to all my rivals today and had to keep the shape during the month to be strongest this Saturday. I am used to fight with Kiprop all the time: all the Diamond League meetings and other events but today, it was a completely different situation. Despite the fact that we are in the same team, we were running our individual race. When I felt him behind me, it was pushing me to speed up. It is my second victory in Marrakech, I think it is my lucky stadium. I'm very satisfied by my second place, even if it s not my PB. Now I'm feeling tired, I'm going to have a rest after a long season, my next challenge is next year in China (at the IAAF World Championships) and the Olympic Games (in 2016). I wanted to be the first. You know, this guy LaShawn Merritt is a world champion, he beats me with experience. Now, I am going to rest until November and I will come next year for the World Championships to fight this guy (Merritt). I used everything I can to give Africa a medal, it is nice to compete for Africa. I plan to go on a vacation for one month, after which I will start training for the next season. I feel like (I am at) home here in Marrakech, I made a good performance last time in African Championship and now in Continental Cup. I had seven months for training and have just run three competitions, this is my fourth one and it's good that I broke a national record. My next plans are to push forward and do much better next time.